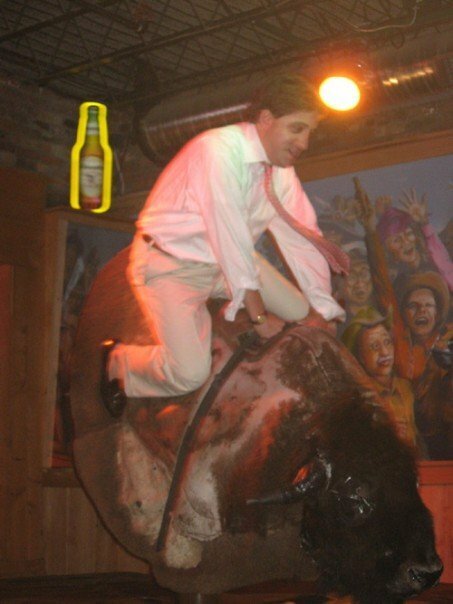 The author faces down a mechanical bull during his July 2007 wedding festivities in a Buffalo, N.Y., barroom. EJFORBES.com is the project of Ed Forbes, a newspaperman who lives in Westchester County with his wife, Emily, and their beagle, Kennedy. He works as the interactivity editor and as a member of the editorial board at The Journal News. This blog, begun in 2008, is devoted to classic American style, cocktails and the Adirondack region of northern New York. Dusted into these broad topics are explorations of the remnants and ruins of old New York, nostalgia for ocean liners, worries about American newspapers, clips of the great 20th century jazz performers and a good deal of amateur journalism on the subject of artisanal cheese. A native of Morris County, N.J., he was graduated from St. Lawrence University in Canton, N.Y., with a degree in English, history and Canadian Studies in 2002. Forbes has lived in Lake Placid, N.Y., where he served four years as editor of the weekly Lake Placid News, and in Manhattan, where he earned his master’s degree at the Columbia University Graduate School of Journalism. When not worrying about the future of newspapers or daydreaming about the Adirondacks, he enjoys a good cocktail and collecting matchbooks. Contact Ed Forbes at ed.forbes02@gmail.com.